As the reader can see, the women – both mortal and immortal – whom we have briefly mentioned, those who were known far and wide for their exercising of “certain mystical powers,” were indeed distinguished. And we haven’t even gotten to the Irish yet! But of all those who appear on this illustrious list, it is only the Sirens who lure with their eloquent song, promising knowledge of all that there is to know. ing all things, yet for ever unknown. . . .
with whom they have much in common, knowing both the past and the future. (18) who, “by the melody of their singing enchant” (19) “whoever comes their way.” (20) Warning Odysseus of the perilous danger of their allure, the “queenly Circe” (21) in-structs him in the ways of hearing their sweet song without succumbing to harm. And so it was that the moment the “magical Sirens” (24) eyed “the swift ship . . . they directed their sweet song toward” (25) Odysseus, taunting him to “listen here to our singing; . . . to the honey-sweet voice that issues from our lips . . . .” (26) And Odysseus, hearing their mellifluous sounds, was sorely tempted, but his men followed the warnings of Circe and lashed him tighter to the mast. impulses in life as yet unmoralized, imperious longings, ecstasies, . . .
musical contest and pulled out their wing feathers to make themselves crowns. of the earth for whom wings are a most inappropriate appendage, unless, as Jane Harrison long ago suggested, we understand their role in connection with the dead. 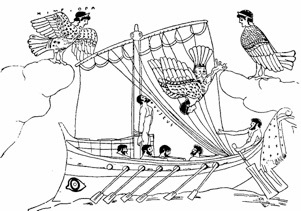 Regardless of the rarity of their images in Greek Art, (36) Harrison relied on her acute intuition and intimate knowledge of art and of all things Greek to put forward the theory that the Sirens were soul-birds in the same sense that the Egyptian Ba, the Soul, which accompanied the deceased “as a human-faced bird,” (37) was depicted hovering, wings spread, over the mummy, or perched protectively upon the funerary bier. Of the more obscure funerary aspects of the Sirens, Harrison reveals a side of their history that is most illuminating to our understanding of them. placed on tombs as a sort of charm, a probaskánion, a soul to keep off souls. And that is not all. It was only in later times that they appeared “as mourners, tearing their hair and lamenting.” (42) They are even shown “bearing the dead in their arms.” (43) The deeply personal involvement of the Sirens in these touching depictions makes it clear that, in time, “their apotropaic function was wholly forgotten.” (44) Such heart-wrenching images are more in keeping with those of Creon standing center stage with his dead son in his arms at the end of the Antigone, or of Lear, howling, hold-ing his beloved Cordelia dead in his arms, “dead as earth,” (45) as he so pitifully tells us. seven inner circles revolved slowly in the opposite direction . . . . The great Classical scholar Francis Cornford has diligently noted in his introduction to the Myth of Er that the “Sirens sing eight notes at consonant intervals forming the structure of a scale (harmonia), which represents the Pythagorean ‘music of the spheres’.” (48) What is generally meant by the musical term ‘consonant interval’ is that the sound generated is “pleasing to the ear.” (49) Of the ratios considered capable of producing such pleasing harmonies, namely, “the octave 2:1, fifth 3:2, and fourth 4:3,” (50) only the octave, the eighth, would satisfy the definition of ‘harmonia’. In fact, “according to the oldest Greek musical theory of Philolaos, the octave was first called ‘Harmonia’ and [only] later ‘Diapason’,” (51) and so, therefore, literally defines it. Not only has Plato found for the Sirens well-deserved release from their tortured existences, but he has positioned them in a place of highest honor, each singing a note against which the Fates offer their chanted elaboration. The harmonic overtones and undertones of these female voices weaving their song together must have been beyond spectacular to hear, but that such singing would constitute what is known as the ‘music of the spheres’ which, in itself, is an enchanting idea, is another matter altogether. To prove the point, if what they sang was truly the ‘music of the spheres’ even though the specific key in which the Sirens sang is not named, that key should be discoverable merely by knowing the keynote associated with the planet upon whose rim each stands. All of this is very, very far from everyday thinking. But mythology is not about everyday thinking. It is about magical thinking and about teaching the Truths of reality to the listener who is prepared to hear. It has been said that one must exercise great caution in the use of the Sun tone for meditation. The same holds true when one enters the enchanting world of mythology. the sun tone represents a door from one world into another. . . . Once you . . . This, too, is essential for succumbing to the pleasures of enchantment. 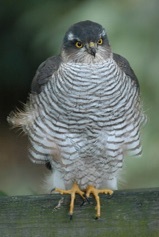 FRONTISPIECE IMAGE: PHOTO OF ACCIPITER NISUS (FEMALE) EURASIAN SPARROW-HAWK COURTESY OF MENEER ZJEROEN <http://www.flickr.com/photos/nuskyn/4028311597/>, CREATIVE COMMONS. FROM: JANE HARRISON, PROLOGOMENA TO THE STUDY OF GREEK RELIGION. SEE NOTE 31 BELOW. 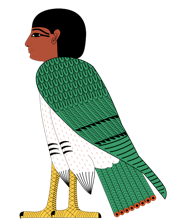 EGYPTIAN BA (‘SOUL-BIRD’). ORIGINAL ART COURTESY OF JEFF DAHL, CREATIVE COMMONS. 1. Spoken by the Sibyl of Cumae in The Metamorphoses of Ovid. Mary M. Innes, Translator, Intro. (Middlesex: Penguin Books Ltd., 1955-1973), Book XIV, 101 passim, pp. 314-15. 3. D. P. Simpson, Cassell’s Latin Dictionary. (New York: Macmillan Co., Inc., 1977.) “Carmentis”, p. 92. 4. Ibid., “carmen”, p. 92. 6. W. Warde Fowler, The Religious Experience of the Roman People: From the Earliest Times to the Age of Augustus. The Gifford Lectures for 1909-10 Delivered in Edinburgh University. (London: Macmillan and Co., Limited, 1933), p. 53. 10. The Metamorphoses of Ovid. Mary M. Innes, Translator, Intro. op. cit., Book XIV, 101 passim, pp. 314-15. 11. See: Tracy Boyd, “The Power of Naming: Notes for a True Reading of the Oedipus Rex” at <www.sacredthreads.net>. 12. Robert Graves, The Greek Myths. Two Volumes. (New York: George Braziller, Inc., 1959), Vol. II, The Foundation of Troy, 158.q., pp. 263-64. 13. See: Tracy Boyd, Circe’s Circle of Oaks at the Edge of the World” at <www.sacredthreads.net>. 15. T. S. Eliot, The Lovesong of J. Alfred Prufrock, from Prufrock and Other Observations, 1917. 17. Jane Harrison, Prolegomena to the Study of Greek Religion. (New York: Meridian Books, 1955. Originally published in 1903, then 1908, and again in 1922), pp. 198-99. 18. The Odyssey of Homer. Translated with an Introduction by Richmond Lattimore. (New York: Harper Colophon Books: Harper & Row Publishers, 1975), Book XII. 39-40, p. 186. 19. Ibid., Book XII, 44. 20. Ibid., Book XII, 40. 21. Ibid., Book XII, 36. 22. Ibid., Book XII, 45. 23. Ibid., Book XII, 47-54. 24. Ibid., Book XII, 158-59, p. 189. 25. Ibid., Book XII, 182 . . . 183, p. 190. 26. Ibid., Book XII, 185 . . . 187-88. 27. Jane Harrison, Prolegomena to the Study of Greek Religion, op. cit., p. 206. 29. Jane Harrison, Prolegomena to the Study of Greek Religion, op. cit., p. 199. 30. See Ibid., Fig. 37, p. 202, also illustrated here, and her detailed description on pp. 201-202. 31. Ibid., Fig. 37, p. 202, of British Museum red-figured stamnos, Cat. No. E440. The inscription over the upper left Siren is ‘Ime(r)opa’ (‘lovely-voiced’). Curiously, the Greek word imeros means ‘longing’, ‘yearning after’. 32. Ibid., p. 200, quot. Eur. Hel. 167. 33. The Metamorphoses of Ovid. Mary M. Innes, Translator, Intro., op. cit., Book V, 542, p. 130. 34. Ibid., Book V, 552-564, pp. 130-31. 35. Robert Graves, The Greek Myths, op. cit., Vol. II, “Odysseus’s Wanderings” 170q, p. 361. 36. Jane Harrison, Prolegomena to the Study of Greek Religion, op. cit., p. 200. 38. See: Elaine A. Evans, who has identified the Egyptian species in her article, “Ancient Egyptian Ba-Bird”, McClung Museum, University of Tennessee, Research Notes, No. 14, November, 1993 at: <http://mcclungmuseum.utk.edu/research/renotes/rn-14txt.htm>. 39. Jane Harrison, Prolegomena to the Study of Greek Religion, op. cit., p. 201. 41. Ibid., pp. 203-04, and Jane Harrison’s own reference to such charms on p. 196. 43. John Pollard, Birds in Greek Life and Myth. (London: Thames and Hudson, 1977,) p. 189, referring to the ‘Harpy Tomb’ from Xanthos in Anatolia; and Chapter XXII Soul Birds, pp. 188-191, passim, which is drawn largely from Jane Ellen Harrison’s writings about the Sirens in her 1903 Prolegomena to the Study of Greek Religion, but which he shockingly fails to acknowledge, probably because he does not agree with her theory of the Siren as soul-bird! 44. Jane Ellen Harrison, Prolegomena to the Study of Greek Religion, op. cit., p. 204. 45. William Shakespeare, King Lear. V. III. 263. 46. Jane Harrison, Prolegomena to the Study of Greek Religion, op. cit., pp. 204-05. 47. The Republic of Plato. Francis MacDonald Cornford, Translator, Introduction, Notes. (New York/London: Oxford University Press, 1945; 27th printing, 1965), X.615-16, p. 354. 48. Ibid., Francis MacDonald Cornford, Introductory commentary on the Myth of Er, p. 350. 51. Hans Cousto, The Cosmic Octave: Origin of Harmony. Christopher Baker and Judith Harrison, Translators. (Mendocino, CA. : LifeRhythm, 1988, p. 96, quot. Platon. 52. Regarding the workings of the octave, Hans Cousto quotes Platon: “The division of a string reveals the octave as the simplest proportion (1:2). . . . To form an octave is to double a frequency [first rising octave] or to halve it [first descending octave].” Ibid. 53. The Republic of Plato. Francis MacDonald Cornford, Translator, Introduction, Notes, op. cit., X.616-17, pp. 354-55. Cornford has translated their names elsewhere in his fascinating introduction to the Myth of Er. They appear here in brackets only because they have been inserted by the author of the present article and are not a part of this particular quotation of Plato’s. 54. See: Hans Cousto, The Cosmic Octave: Origin of Harmony. op. cit., pp. 84-85. This entire book offers a very informative discussion of the sounds of the planets’ orbits with clear diagrams and detailed mathematical formulae by a truly avant-garde musicologist and mathematician. 55. All of these calculations are from Hans Cousto, The Cosmic Octave: Origin of Harmony. op. cit., passim, and pp. 76, 111, 121; and from planetware’s website with further information on Hans Cousto and his brilliant work: <http://www.planetware.de/octave/cosmic-octave.html>. 56. Hans Cousto, The Cosmic Octave: Origin of Harmony. op. cit., pp. 91-92. The Romans made a goddess of the seer Carmentis, dedicated a temple to her and named one of the gates of the city, the Porta Carmentalis, in her honor. (3) This mortal who “prophesied on the Capitoline Hill” (4) was a singer of oracles, or so we should have guessed from her name. The Latin word carmen has many related meanings: ‘a song or tune, either vocal or instrumental, also of birds’, ‘a poem of any kind’, ‘a prediction, an oracle, or oracular declaration’, ‘an incantation’, ‘a religious or legal formula, which in ancient times was composed in verse’. (5) Carmen would appear to be rather an important word.